Each year, Bold Technologies hosts a conference for their software users to network, train, give feedback, and meet staff. The event generates $140k in revenue and draws 225 international attendees with 13 corporate sponsors. The location rotates between Colorado Springs, Colorado; Denver, Colorado; and a city out of state. Since it is held in a different venue each year, a new brand identity is created from scratch to reflect the location. The 2018 conference was held at the Hotel Albuquerque at Old Town in Albuquerque, New Mexico. Since this venue is in the Old Town district of artisans and shops, it felt appropriate to make this identity festive and wholly unique. 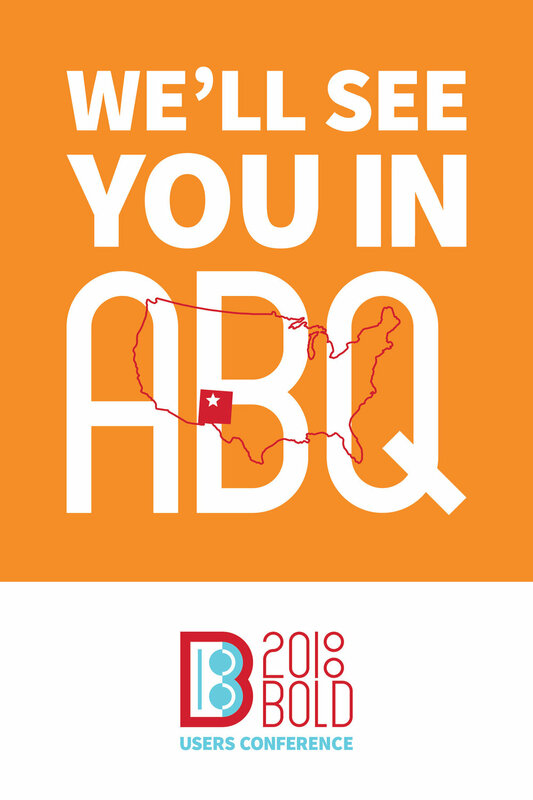 It was fun to come up with the “We'll see you in ABQ” tagline that wasn't so serious and spoke to the relaxed and friendly personality of the location. 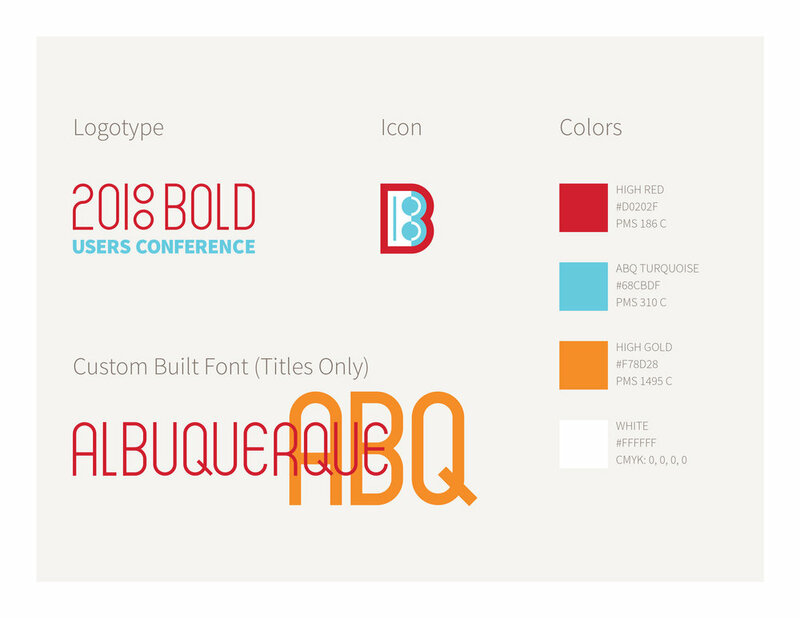 I had a blast creating a logo that referenced both the B of Bold and the 18 of 2018. 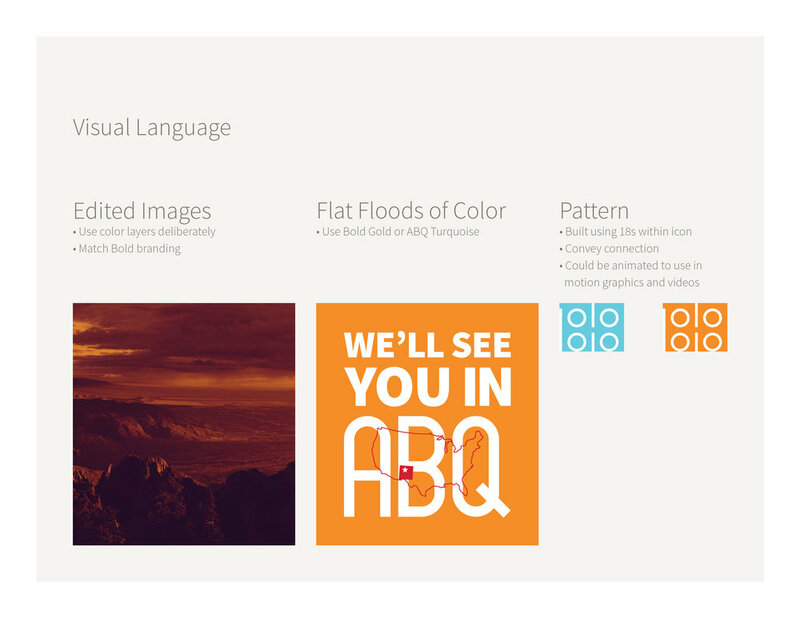 From the logo work, I engineered a new typeface for the display titles—something I haven't done before. A turquoise was introduced to combine with the brightest shades of our branded red and gold. The warm gray neutral is used sparingly while a clean white allows the vibrant colors to shine. Deliverables include a logo; defined color palette; landing page images; smartphone app icons, banners, and splash pages; email newsletter images; promotional products; physical banners; and t-shirts for users and staff. Other items may include promotional postcards, drink tickets, as well as print and digital ads in industry publications and websites.